I wish to address the entire great Zorgian nation and wish you all the best for 2019. With a big thank you to all for your support over the past year. 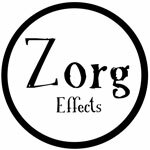 For the upcoming years will have its lot of novelties for Zorg Effects, a non-exhaustive list of them will now be exposed to you in the paragraphs below. As you can see in the image attached to this post, a new Glue Fuzz with a pair of silicon transistors is nearly here. It should gradually replace the Germanium and Hybrid Glue Fuzzes. Germanium Transistors have become too expensive, and have always been not filthy enough for my taste... If you like Germanium, I only have 2 Glue Fuzz left in full germanium and a good dozen in hybrid. Then I will have a few pcbs that I will be sell for a few bucks. It's possible that a final version of the blow! Blow!! Blow!!! for two microphones make an appearance on your screens within a few months. Also, an update of the Blow!, especially for the version with fantom power should see the day. Spoiler: the small power on switch of the fantom will be replaced by DIP switches in the pedal. But bad news: end of January the Blow! prices should increase (but good news: it's the only pedal that sees its price change! ). I wish you good mopeds, cherries, mountain streams and tax form filling!!! In 2019 I'll do a little more repairs. Don't hesitate to contact me if you've broken stuff. I'm also always eager to mod pedals or build you custom devices. - It's best to contact by mail to zorg.effects -at- free.fr Facebook messaging makes me want to eat strawberry cod and I already have enough headaches like this. - For small repairs of a few minutes (changing a switch or resolder a cable), I make a small fee of 20€ of labour plus replacement part price. Otherwise I cost 30 € per hour, plus the price of replacement parts. - I don't fix power sections of power tube amplifiers greater than 20 watts, neither hifi or PA amplifiers exceeding 120 watts. So if it's a pot, a hp or a switch to change I can do it. - sometimes i don't have the parts to fix your devices. Ordering and receiving them can take between 24h and 3 weeks depending on the part. Premier Guitar hits quickly the Small Basstar! "The Small Basstar’s tones can move from lighter grit to aggressive filth. There is a lot of gain on tap, so it’s not a subtle OD, but the character of the distortion overall is smooth and strong with a defined attack." What's to do with a Glorious Basstar. Interview with Kevin Balzan. Kevin plays in: La marmaille, Acropolis Bye Bye, Chouf. The Glorious Basstar V2 is available! Gearphoria reviews the Small Basstar! There's a Small Basstar review is this September issue of Gearphoria!!! The Small Basstar is now available!!! The Blow! is now available!!! An award for the Jour de FET! Overdrive family think that the Jour de FET distortion is one of the best distortion pedal of 2017. It's true, see, it's written here. Interview Gabriel Denneulin - Pédales Zorg Effects from La Chaîne Guitare on Vimeo.